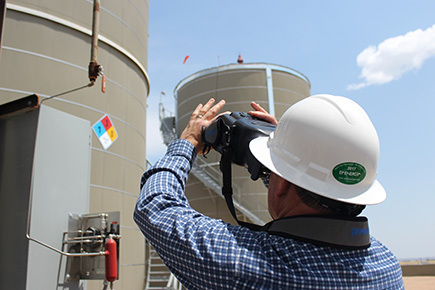 A year-long study conducted by the Utah Division of Air Quality (UDAQ) in 2015 showed high levels of formaldehyde and dichloromethane at Bountiful Viewmont monitoring site in Davis County. Measured concentrations of these air toxics were also often associated with a high cancer risk, exceeding the one-in-a-million cancer risk threshold. However, while this study helped identify these high-concentration and -risk air toxics, it did not provide information on their source or sources. To identify sources of these critical air pollutants, UDAQ, in collaboration with the University of Utah, deployed passive air toxics samplers at 34 monitoring sites located within communities in the Bountiful-North Salt Lake-Woods Cross-West Bountiful area. Sampling sites were selected based on their proximity to emissions sources, typical wind patterns and distance from busy roadways/freeways. Emissions sources included refineries, manufacturing facilities, industrial gas companies and Bountiful City Landfill. Five-day time-integrated samples were collected and analyzed for a suite of VOCs and carbonyls, including dichloromethane and formaldehyde. Moreover, to investigate the effect of meteorological conditions on these air pollutants, sampling was conducted during winter (January-February) and summer (June-July) 2017.